A few weeks ago I had a post about some extensive diagnostic work we were doing with our blind-and-deaf Cocker Spaniel, little Miss Ellie May. She was having intestinal problems and hadn't responded to antibiotics, so our internal medicine specialist in Missoula, Dr. Dave Bostwick, performed some tests to rule out cancers and other threats. Well, we're delighted to report that all of Ellie May's results came back negative. We still don't know why she was having those intestinal problems -- and fortunately they have pretty much cleared up -- but we're relieved to find she's in really good shape. Alayne took this photo of me with my little minionette this evening. Sometimes Ellie May looks more like a teddy bear than a Cocker Spaniel, and as long as I'm holding her, she completely melts. I can drape her over my shoulder, hold her upside down in my arms, or prop her up on my knees. She'll stay absolutely motionless, like a stuffed toy. You can do anything with her at that point. Like put a ridiculous pair of sunglasses on her. Firedog contest update 2: We learned today from Circuit City that the ranch will be getting a check for $3,641 for the animals -- thanks again to everyone who voted! Help! I'm Stuck! Part 2. Upon further investigation, it was clear that Stuart had encountered his first 'spatial reasoning' test and flunked. 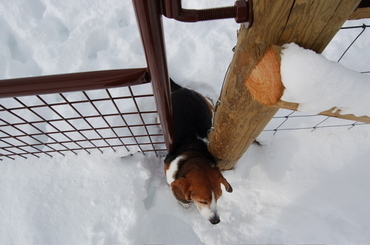 Of course, he had wedged himself between the gate and the post we hang the gate on, not at the other end where the gate swings open. That would have been too easy. Beagle-boy ... what were you thinking? Having taken Spatial Reasoning 101 myself and passed, I pointed out to Stuart that if he could somehow fit through the opening going in, then surely ... surely! ... he could fit through it going back out. He wasn't buying that argument. 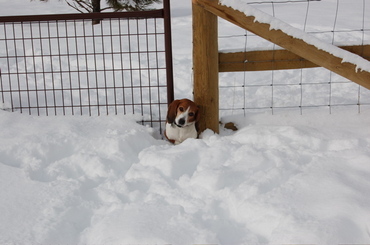 So it took a two-person Beagle Extraction Team to free this boy. Gloria helped me as we lifted his front end off the ground, then turned one shoulder up and in, making him just slim enough to squeeze through ... and we pushed him back out. Stuart has been here just a few weeks but he has completely stolen our hearts. He is a perfect house dog, gets along with everyone, has excellent manners, and is a very affectionate, loving, and funny little guy. Just like Widget except, yes, he's got real legs. We are thrilled to have him. You can expect many more posts on this boy ... just not like this one, I hope! Update on the Firedog contest: We learned that the Grand Prize went to "Hank" and Neuse River Golden Retriever Rescue of Raleigh, NC. However, the Rolling Dog Ranch will still receive a contribution of $1,000 ... and $1 for each vote we received -- we don’t know how many that is yet, but we will keep you posted. We are so appreciative of Kim Taylor for selecting us to participate in this contest. Thank you Kim and Summitt -- and thanks to all of you who voted for Summitt! Tyler our deaf English Pointer has always done things his own way ... whether it's sleeping on shelves, pointing at walls, or sleeping in custom-made gravel holes. If it's just a little different, you can be sure he's done it ... or soon will. 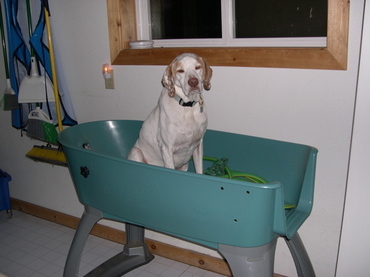 So it came as no particular surprise when we discovered in the past few weeks that he had decided to start sleeping in the portable doggie bathtub at Widget's House. This tub has hoses curled up inside it, so it's not exactly a comfy spot to snooze, but it is different and that apparently was the appeal. So Alayne got this shot of Tyler being rudely woken up when she walked into Widget's House last night to let the dogs out, found him in the tub and started snapping photos. Hence the look on Tyler's face. And it's not like he's embarrassed to be seen sleeping in a bathtub ... just annoyed at having his slumber interrupted by a camera flash. We're just waiting to come in one day and find him asleep on the stove. A few weeks ago, as we watched blind Callie groom yet another of our black or black-and-tan dogs, I told Alayne I was going to do a blog post on Callie's single-minded focus on the black-coated dogs. We had never seen her groom any other kind of dog. And yet she's blind, so it can't be the color! When Callie first began offering her grooming services, it seemed like she only did the big dogs ... but then we realized it wasn't related to size ... it's just that all the big dogs she selected for grooming were the black and black-and-tan ones. We'd never see her grooming a Blanca or a Spinner, for instance. 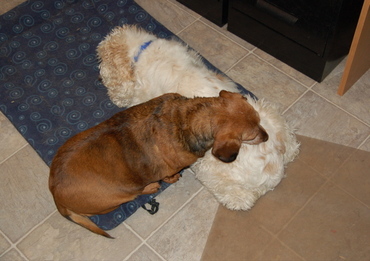 But then, just a few days ago, we discovered Callie giving little blind-and-deaf Ellie May a good grooming here in my office. I have no idea why, after all this time, Callie suddenly decided to branch out, but she did ... and I have the photo to prove it! Maybe she just felt it was getting monotonous doing only the dark dogs ... or maybe she felt unappreciated ... who knows? Whatever the reason, Ellie May sure enjoyed the spa session. Alayne and I were heading over to Widget's House this afternoon to medicate one of the dogs when we heard a cat wailing. I turned around and looked back over my shoulder towards the cat house. 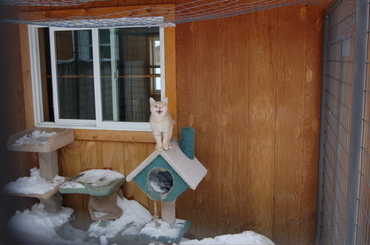 There, on top of a cat condo in the snowed-in outdoor enclosure, was blind Herbie. And he was stuck. He had heard us come outside and was calling for help. Today was bizarrely warm -- we actually got to 40 degrees by midday after a week of sub-zero and single-digit temperatures -- and we had opened the cat house window so some of the cats could go "snowshoeing" in their enclosure. Well, this was the first time it's been warm enough to leave the window open since Herbie arrived a few weeks ago ... and he was adventuresome enough to go exploring. Except that finding his way back from his perch on the cat condo was another story altogether. So I had to go into the cat house, open the window wide, and reach through it to pluck him off the condo and bring him back inside. The gate to the enclosure is buried in two feet of snow and wasn't budging, which is why I couldn't simply go into the enclosure to get him ... and why I had to take this photo through the fence. Herbie heard me opening the window and he knew I was coming for him, so he turned around and started reaching out towards me with a front paw ... "I know you're there somewhere!" The February issue of Equus, one of the leading horse magazines in the U.S., has a very nice back page story about the sanctuary. That's what the cover of the February edition looks like above. We did the interview for the article a few months ago, and sent the magazine photos they could choose from to illustrate the story. They used one of Alayne and me with blind Nikki (it's one of our favorite photos). 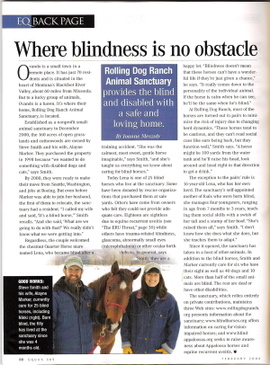 Our biggest challenge is convincing the average "horse person" that blind horses can have a wonderful quality of life, so we are delighted to reach Equus readers with this message. 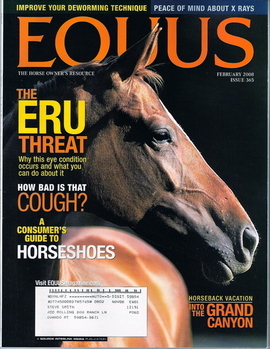 Ironically, the reporter first called to interview us about the subject of the cover story -- ERU, or equine recurrent uveitis, which is the leading cause of blindness in horses. After talking with us, the reporter decided to do the back page feature on the ranch instead of working us into the ERU story ... which was the better deal! You can find Equus at the usual book stores like Barnes & Noble and Borders, as well as at equine-related retail outfits. Unfortunately Equus does not publish its content online. But if you click on the photo of the article for the larger image, you may actually be able to read it okay. A couple of weeks ago we posted the news about Circuit City's online contest to choose a new mascot for their Firedog technology service and how it could benefit the ranch. The contest ends this Saturday, so if you haven't already voted, we hope you'll head over to the the Firedog site now and cast your vote for Summitt, shown in the photo. Sanctuary supporter Kim Taylor just informed us that her dog, Summitt, has been selected as a finalist for the mascot of Firedog, Circuit City's technology support service. The great news for us is that if Summitt wins the contest, for every vote she receives, Circuit City and Kodak will donate $1 to the animal sanctuary of Kim's choice -- the Rolling Dog Ranch! The sanctuary could receive up to $100,000 AND if Summitt wins the Grand Prize, an additional $50,000! Please help the Rolling Dog Ranch and Summitt in this fun way to support the sanctuary. 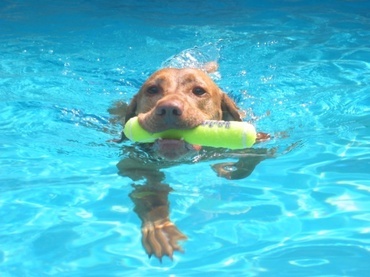 You can vote for Summitt on the Firedog website -- look for the wonderful photo of Summitt swimming, shown above. Follow the instructions carefully -- once you vote, you'll receive a confirmation email and you will need to click on a link in the email to verify your vote. 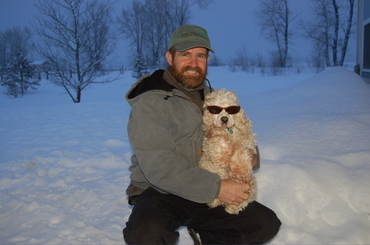 If you don't get the email -- it will say "firedog photo contest" in the 'From' line -- then check your spam filter or junk mail folder. It's not unusual for these Web site-generated emails to be flagged as spam. Please note that we are not involved in running the contest and that the voting takes place on the Circuit City Firedog Web site, so we cannot help with any technical issues with the Web site or the voting process. Although having cast my own vote today, I can tell you it's very quick and simple! Please also let your friends and family know about the contest. You can help Summitt and the Rolling Dog Ranch win big! Cast your vote for Summitt here. Thanks for voting for Summitt! Late yesterday afternoon Jodie called from the welcome center to say she and Gloria had just found blind Nikki suddenly acting like Copper Kid, our neurologically impaired "wobbler" horse. What?!? I was on a videoconference with Alison, our development director in Helena, so I hurriedly signed off, suited up and raced out. Nikki was still in the corral, standing stiffly. I asked Gloria to help move her while I stood back to watch, but it was clear Nikki didn't want to move. We finally got her going, and I was stunned to see our beloved little 4-year old filly dragging her hooves, swaying, and looking like she had no idea where her feet were. We pushed on her to go back, but she planted her rear feet widely and wouldn't budge. Oh, no. My first thought was that she indeed looked and acted like a wobbler. Copper Kid was three when he developed his symptoms. Could we really end up with two wobblers? 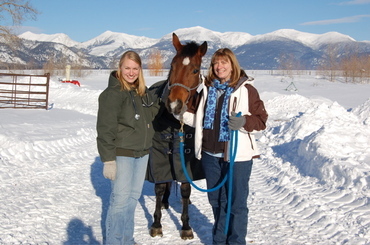 I called our equine vet, Dr. Erin Taylor, from the corral. Being a wise sort, she immediately realized I needed more "treatment" than Nikki did at the moment, and proceeded to explain why it was very unlikely Nikki was a wobbler. Generally wobblers start showing their symptoms gradually and then progressively become worse with time. Just the day before, Nikki had been bucking and kicking and racing around the corral. So it would have been unusual -- to say the least -- that she could have become a wobbler in 24 hours. Instead, the wise doctor suggested, it was more likely Nikki had suffered some kind of trauma that interfered with her nervous system. Yet there were no bent corral panels, no marks or swelling on Nikki, and nothing else I could see to indicate any injury. But Erin walked me through the possibilities. As an example, she mentioned the brachial plexus, an area near the shoulder where a network of major nerves comes together. 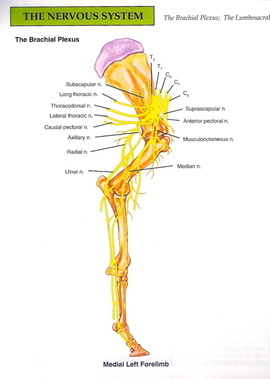 Erin said that if Nikki had slipped and done "the splits" with her front legs, or just slipped and shot her leg out at an awkward angle, this could have damaged the brachial plexus ... and that could explain a good part of what we were seeing. And if Nikki had fallen in the process and tweaked her spine, this could affect the nerves running to her hind legs and thus explain the ataxia we were seeing there. In a snow-covered corral with a frisky blind filly acting like a bucking bronc, that kind of major wipeout could well be possible! Nikki was too unstable to transport to the hospital last night, so Erin told me to go ahead and do the same two things she would do anyway: inject Nikki with a whopping IV dose of dexamethasone (steroids) and an IV dose of banamine, a non-steroidal anti-inflammatory, and see how she was in the morning. Gloria and Jodie gently moved Nikki out of the corral and into her stall in Lena's Barn while I went to the house to get the drugs and load the syringes. I gave Nikki the injections, called Erin to report in, and she asked me to call her again about 9 p.m. with an update. Erin's colleague, Dr. Angela Langer, was already scheduled to come out to the ranch this afternoon, so we knew Angela would be able to do an exam when she arrived today. By this morning Nikki was walking in her stall -- that was an improvement! -- but still dragging her feet some and looking unsure in her movements. Erin had me give her another round of the dex and banamine, and then wait for Angela's assessment. 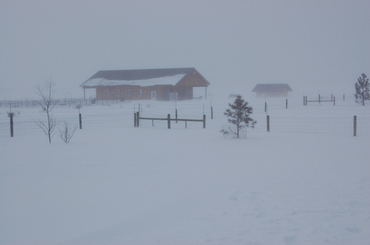 And that's what you see in the photo at the top of this post ... Angela is examining Nikki outside Lena's Barn. Angela's mom, Anne C. who is visiting from California, is holding Nikki for her. By this afternoon, Nikki had dramatically improved ... I couldn't believe the difference when I walked her out of the stall for Angela to examine. Angela concluded that Nikki likely had suffered the very scenario Erin had described, and that we should continue with the current treatment, but begin tapering off the doses. Needless to say, we were much relieved by Nikki's progress and the diagnosis! 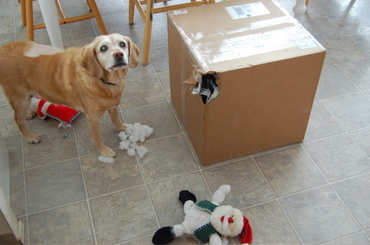 Today the UPS guy dropped off a big box of toys sent by a wonderful sanctuary supporter in Florida, and before you could say "soft squeaky toy," Miss Cardboard Shredder went to work. As I have reported before, blind Goldie is just a wee bit OCD about soft squeaky toys, or SSTs. Her SST rules-to-live-by include: 1) One is never enough; 2) Where there's one there must be two; and 3) Where there are two, there must be even more! 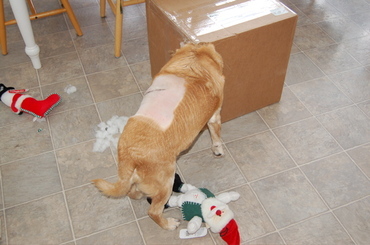 Goldie's back is shaved because she had surgery last week to remove a cancerous growth from over her ribcage. The biopsy results came back on Saturday and showed good, clean margins around the tissue, so we know we got it all. There will be many more boxes to shred in her future! I was coming back from Beauty's Barn this evening just after 5 p.m. and saw the dogs gathered on the front porch of Widget's House. Jodie had just gone over to let them out again before feeding them. It was already 10 below zero and the sun was barely below the horizon; that's Ovando Mountain in the background, still capturing some light from the setting sun. You can tell from the gathering on the porch that the dogs do not want to go outside and go potty. No, sir. Our really sophisticated wireless weather station, an expensive LaCrosse Technology unit that measures wind speed and lots of other conditions, goes offline at 20 below zero ... now isn't that helpful? 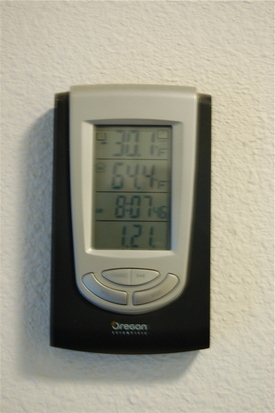 So when it gets this cold, we rely on the $10 thermometers to know what the temperature really is. 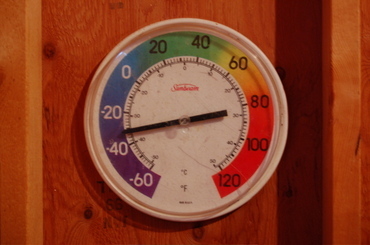 When I returned from barn chores two hours later, it had warmed up to a brisk 18 below zero (-27 C) in the sun. As I sat down to write this post about 5:30 p.m., it had already dropped another 5 degrees to 15 below ... but the National Weather Service office in Missoula had a forecast calling for a low of minus 19 for tonight. So I just called the office (we're "official weather spotters" for the NWS) to let them know we were going to blow past minus 19 in a matter of minutes. They want that kind of feedback so they can update their forecasts accordingly. And sure enough, at 5:53 p.m., we just hit 20 below. It drops that fast after the sun sets out here.